I'm happy to report that THE KILLING KIND made Bethany Warner's Top Ten of 2015 list at The Word Nerds, alongside books by Robert Galbraith, Sean Chercover, Lyndsay Faye, and more! Thanks, Bethany! The Passionate Foodie, Richard Auffrey, paired his Favorite Fiction of 2015 with drink selections. I'm pleased to report THE KILLING KIND made his list, and (while Hendricks is more of a beer guy) I couldn't be happier with the drink he chose: a 15-year-old Laphroaig. You may recall that earlier this year I chatted with Steven Nester for PRX's Poets of the Tabloid Murder. Well, Steven stopped by The Rap Sheet yesterday to talk about his Favorite Crime Fiction of 2015, and listed THE KILLING KIND among it! And finally, I'm at Maine Crime Writers today, where I shared my elf-noir sequel to the Rankin/Bass production of Rudolph the Red-Nosed Reindeer, "The Final Bough." Jade Walker, overnight editor of The Huffington Post, counted THE KILLING KIND among her favorite reads of 2015! Thanks, Jade! Last Friday, a deranged lunatic with a history of violence toward women shot up a Planned Parenthood clinic in Colorado Springs. As I write this, another mass shooting is unfolding in San Bernardino, this one targeting a facility dedicated to serving people with developmental disabilities. In between, according to the Washington Post, there were two other mass shootings I hadn't even heard about, which brings the total so far this year to 355. 355. That's more than one a day. And that's just mass shootings. When you factor in shootings that affect fewer than four people, accidental shootings, and suicides, the death toll is staggering. In fact, gun deaths are poised to surpass automobile deaths this year, at approximately 33,000. We—individually and as a society—have a moral obligation to do something. 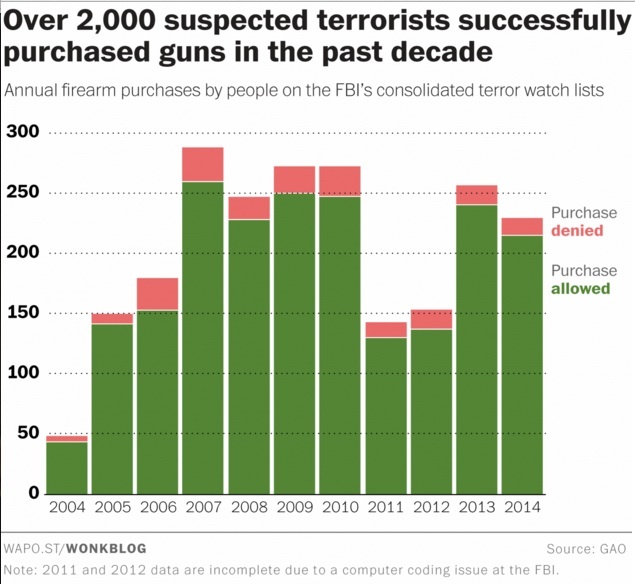 The NRA would have you believe that any attempts to restrict gun sales would violate our Second Amendment rights—a specious claim they must believe, because why else would they spent good money killing bills that would have prevented people on the FBI's terrorist watchlist from legally purchasing firearms? I don't pretend to have all the answers. Anyone who does is selling snake-oil. And no one law is going to end gun violence in America. But the fact is, it's possible—easy, even—to take decisive action without running afoul of the Second Amendment. 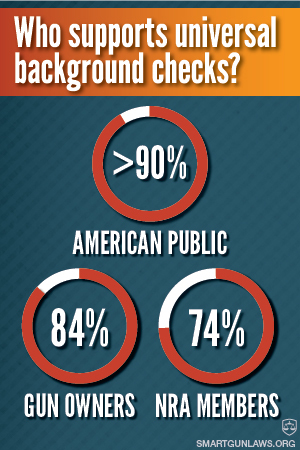 All we need to do is close the so-called private sale loophole by implementing universal background checks. 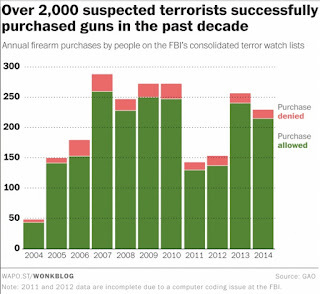 Mountains of data indicate that doing so would dramatically reduce gun deaths, and it wouldn't infringe on the constitutional rights of a single law-abiding American. Currently, only eight states require universal background checks. (The term "universal background check" may sound Big Brother-y, but all it means is a background check is required for any gun sale, professional or private.) According to the Law Center to Prevent Gun Violence, "states with universal background check laws experience 48 percent less gun trafficking, 38 percent fewer deaths of women shot by intimate partners, and 17 percent fewer firearms involved in aggravated assaults. States with universal background check requirements also have a 53 percent lower gun suicide rate, and 31 percent fewer suicides." And if universal background checks were implemented nationwide, those numbers would likely improve, because criminals couldn't simply drive to neighboring states to purchase firearms. Seems sensible, right? That must be why it's so damn popular. Plenty of folks on social media like to rail about how gun owners care more about their firearms than public safety, but the fact is, the vast majority of them support universal background checks. Hell, 74% of NRA members do. So, in the face of a rogue gun lobby that arms terrorists and ignores the wishes of its own constituency, what can you or I do? Well, for starters, we can tell our legislators that if they don't take action, they won't be our legislators anymore. Sure, many of them are swimming in the NRA's blood money, but it won't do them any good if we refuse to re-elect them. Don't know how to contact your representatives? People Magazine's got you covered; they recently published the contact information for all 535 members of Congress and urged their readers to contact them demanding stricter gun laws. Not sure what to say? Feel free to crib heavily from this post, or the letter I wrote to my representatives four months and nearly 150 mass shootings ago. But by god, do something. Write. Call. March on Washington, if that's what it takes. We're only helpless if we allow ourselves to be. Our elected officials have made it clear they aren't interested in fixing this, so it's up to us.